While this happened a few days ago, it’s only just been brought to my attention. 13 years on from his disappearance, Richey Edwards of Manic Street Preachers has been declared dead. While it’s really just a legal status at this point, I’m still finding this incredibly depressing. Part of me has always lived in the hope that Richey really did just drop off the radar, and was living the quiet life somewhere, far away from the attention with which he seemed unable to deal. Richey was a rock star of the highest order, and is deeply missed by Preachers fans. In rememberance, I’ve included the Preachers’ “Australia” video below. 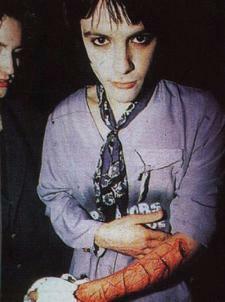 The fourth single release from the 1996 album Everything Must Go, Nicky Wire wrote the song as a way of dealing with all the emotions surrounding Richey’s disappearance in 1995.